Situated close to the small village of Chrifia, on the southern periphery of Marrakech, the course at Noria Golf Club celebrates the traditional architecture and landscape features of its surroundings, embracing diagonal water ditches (seguia), natural creeks (oued) and a water lifting wheel (noria) with small buckets to transfer this precious natural resource into small aqueducts for irrigation. Three distinct landforms are encountered during a round at Noria: olive orchards (in the making) and (recently planted) lavender fields on the early holes, rugged desert terrain on the back nine and, in between, a formal oasis that runs north from the clubhouse, affecting the closing holes on each of the returning nines. In due course, residential units will be constructed, located in three sectors, two on the outward half and one on the inward half. 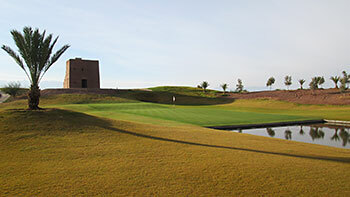 Anchoring the development, a stunning two-storey clubhouse, designed by Youssef El Melehi, sits in front of the formal pool that separates the 9th and 18th greens. The canvas roof of this magnificent structure takes its inspiration from the nomad’s tent, wrapping itself around a large observation tower, the largest of several that run through the spine of the property. On the course, the opening hole plays to an offset green, the first of several putting surfaces placed diagonally to the centreline of the fairway. Another diagonal element arises at the next hole, where a water channel cuts across the fairway at a 45-degree angle in front of the green. The left doglegged 4th features the only bunkerless green on the course and it’s followed by the longest par five on the card, as holes swing back towards the clubhouse, with the Atlas Mountains as a backdrop. The remarkable 175-metre 8th is without doubt the signature hole at Noria, played from an elevated tee position across a reflecting pool to a rectangular Biarritz green that sits between the water and an authentic Moroccan bell tower. It’s a very simple, yet incredibly visual little hole that will live very long in memory of golfers who play here. On the back nine, the short par four 11th doglegs right across a dry-bed creek to a two-tiered hour glass-shaped green that slopes markedly from front to back. A path strewn with large rocks and cactus plants then leads down to another thrilling short hole, with the fairway and semi-blind green of the 12th hole lying well below the level of the surrounding rocky terrain. The routing heads north again at the 14th, the first of back-to-back par fives, with a big carry required over a wetland area from the tee. A large body of water sits to the left of this hole and a water channel – complete with Noria water wheel – runs away from the lake, before cutting diagonally across the front of the 15th green. The round ends in spectacular style with the 18th returning to the 9th hole’s long water channel, but this time on the other side of the reflecting pool. To the right of the tee boxes, there’s a traditional Moroccan irrigation system (a “khettara”) with open pits leading to an abandoned underground canal. A diagonal line of bunkers protects the front of the rectangular putting surface, whilst water to the left of the fairway challenges all the way to the home green. Noria was the last course I played in my Moroccan visit and despite its somewhat quirky design I thought was the best of the 3 I played in Marrakech. The course has been carved out of some uninspiring flat desert terrain, despite that there are some gentle undulations and elevation changes to make the routing interesting. The generous fairways were a joy to play from; lush and springy grass meant I never had a poor lie; however any loose shots are severely punished if you stray from the green stuff into waste areas which are baked as hard as concrete by the desert sun. If you’re lucky enough to find you’re ball in the waste its like hitting off a stony cart path! The course is well bunkered, catch a fairway bunker and it’s almost impossible to make the green in regulation even though the sand is forgiving. I thought the best holes were the par 3’s and 2 par 5’s, the 5th and 15th. Unfortunately the beautiful club house is barely used, both the bar and restaurant were closed when I visited and looked to have been so for a while, shame not to enjoy a post round beer overlooking the rectangular reflecting pool between the 9th and 18th greens. Noria impresses from the moment you park in the submerged car park to the side of a modern clubhouse that’s designed in the style of an enormous Bedouin tent. There’s also a very smart looking practice facility to the side of this huge building. It’s great that there are currently no residential elements adjacent to the fairways but it’s evident that there will be houses built in three blocks, two on the front nine and one on the back nine so the severity of their eventual intrusion is anybody’s guess right now. I liked the way that irrigation ditches are brought into play at the 2nd and 15th holes but I didn’t really enjoy having to wait six holes before playing the first par three on the card, even if it’s as aromatically invigorating as this one, with a field of lavender planted in the small gully between the teebox and the raised green. Two holes later, and the second short hole is reached. It’s certainly contrived, with the green set squarely behind a rectangular pond (and in front of a bell tower), but I think it works really well, especially as the putting surface has been constructed as a stylish, long biarritz, with the back portion of the green built at a higher level than the front – see what you think from the photo I took. It’s followed immediately by another rather fabricated hole, where – yes, you’ve guessed it – another reflecting pool splits the rectangular greens of the 9th and 18th holes, in front of the clubhouse. Again, I think this also works well, with the formal water ponds on the central axis from the clubhouse holding true to the 2008 Noria master plan to recreate aspects of a traditional Moroccan village. The sunken par three 12th is another terrific short hole, played below the level of the surrounding desert landscape to a semi-blind green. The par fives at 14 and 15 both have water hazards in play – a pond threatens to the left on the first long hole and an irrigation ditch hampers on the second hole – before turning for home, where the scale of the fairway and greenside bunkering at the par four 17th is something to behold, especially with the sight of the Atlas Mountains looming in the background. A little bit like Al Maaden, which Kyle Philips designed around a Moroccan water garden on a far grander scale, Noria’s a course like no other that you’ll ever play. I’m certain architect Steve Forrest will never build another course quite like it but I’m sure it's one he’s glad to have constructed for its technical challenges.